Jörg Tüttelmann, LSG Sky Chefs’ Vice President Culinary Excellence, suggests we serve a small, crisp apple as a snack option between meals on long-haul Business Class flights – as a fresh apple would bring the snacking experience to a whole new level of purity in taste. “The passenger will experience more than a snack rather a story about the farm where it came from, and its overall heritage”, says the Culinary Expert. Indeed, Jörg’s chefs hear the words “healthy, tasty, fresh, and best” often from their boss. The former Executive Chef at the Ritz Carlton in Wolfsburg, Germany (which received two Michelin stars and 18 Gault Millau points during his tenure), he has spent most of the last decade consulting top-tier hospitality brands all over Europe on everything from creative menu designs to how to implement tough operational standards. Jörg maintains his belief that our airline customers can achieve culinary excellence by getting the smallest of details right. “A high quality product can be revealed in the most subtle of ways – but in a way that your passengers will still notice.” He calls it “a return to the basics,” but at a level worthy of culinary excellence. “There’s a great deal of complexity as well as perceived limitations when it comes to airline cuisine. 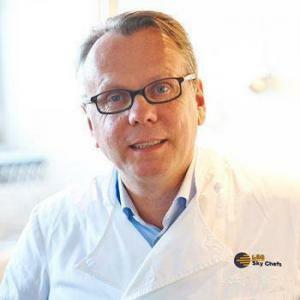 It’s important that we continue to challenge ourselves, and our customers to design menus without limitations and rather focus on creating a unique and unforgettable customer experience, every time,” adds Jörg, who will be one of LSG Sky Chefs’ experts sharing his experiences with you. He will start with his blog posts in April – so watch out!